One of the pleasures of local history is the occasional unexpected contact from families of former Mount Evelyn residents. Recently we received information about Hugh and Alice Wray from Ann Nash, Alice’s great-niece. Ann provided photos and extracts from the family history. Hugh Wray and Alice Holt were married in 1927. They had purchased a small general business in Railway Crescent, Mount Evelyn – now Wray Crescent. Trading as Hugh Wray and Co, they immediately set about developing the business. 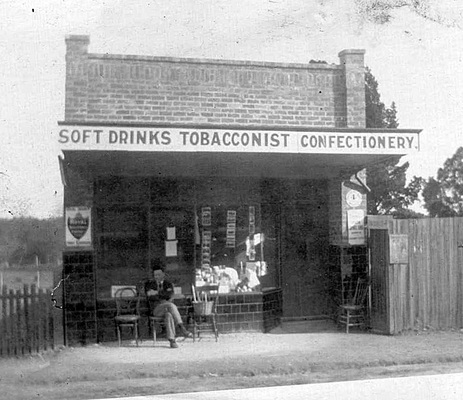 Originally the store concentrated on greengroceries and confectionery. The Wrays set up tea rooms for tourists on Saturdays (their delicious ice cream was long-remembered). They operated a news agency, an agency of the State Savings Bank (Alice’s specialty) and an estate agency (this was Hugh’s province). The business was given an immediate boost by the construction of Silvan Dam. Many of the workmen who took up residence in the district were Italian migrants. Alice, always good at languages, did a crash course in Italian. She was then able to write letters home for many illiterate workers, and looked after their financial affairs. 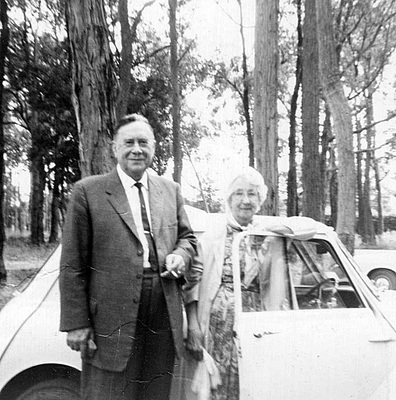 The Wrays had set up their home on a five-acre block fronting Birmingham Road (then known locally as the ‘Zig-zag’) overlooking Lilydale and the Olinda Creek valley. The house still stands in Birmingham Road, two doors up from Irvine Street. Hugh, who was nicknamed ‘The Mayor of Mount Evelyn’, was appointed a Justice of the Peace. He was also active in the former Church of England in Birmingham Road. 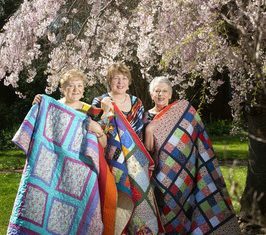 Alice was the president of the Country Women’s Association (CWA) when it formed in 1941. She was elected group president of the Dandenong Ranges CWA in 1943. Alice died in 1971 and Hugh in 1972. Railway Crescent was re-named Wray Crescent in 1976 in honour of Hugh and Alice and their contribution to the town. A number of Mount Evelyn streets were renamed at that time, following recommendations from the Mount Evelyn Environment Protection and Progress Association (MEEPPA). Much confusion had been caused by near-duplicate names, such as Railway Road and Railway Crescent. You can read more about our street names and their origin in the Mount Evelyn History Group publication Street Names of Mount Evelyn.